Wilderness, Self-Reliance, the Quest, History & Community, it all comes down to AUTHENTICITY. From the pristine forest and mountains surroundings to the genuine and friendly staff within. From the hand-crafted cedar of the wood-heated sauna to deep snow, bountiful huckleberries and the keynote species that amble through the meadows – this place is the real deal. Whistler and the Sea to Sky zone boast a rich and storied alpine history and Callaghan Country’s Journeyman Lodge is a conduit that reaches back to that original quest for adventure. It’s a cozy fortress of comfort set in an untamed natural environment that remains unchanged by the “progress” that encroaches on so many other aspects of our lives. 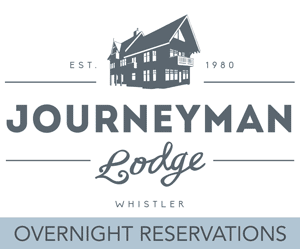 Journeyman Lodge is about building your own adventure. It’s about choosing a more difficult path with a greater reward. It’s a destination, but it’s also the start of your next great journey. The experience in the wilderness outside the lodge is unique to each guest’s own goals and perspective but inside the dining room, lounge or sauna all those individual paths weave back together to create a tapestry of authentic mountain culture. It’s a collection of fleeting moments and genuine experiences that will continue to mesh and evolve forever as more and more people are drawn into the mountains in search of something tangible, magical and real. CHALLENGE, INSPIRE & ENRICH YOURSELF AT CALLAGHAN COUNTRY!